I was recently asked to give an inspirational speech, which left me at a loss really, as I don’t consider myself inspirational at all! Despite being far too normal to be inspirational, I have no trouble getting, or even staying, inspired. I have so many ideas that I had to invest time into working out how to organise them. So why is that important? Does that ability give me any competitive or business advantage? I think it does. Being constantly inspired means I always have work to do, the next thing to try, an answer to THAT problem, or a way to find one, and something that is going to be my next big idea, when this current one has run its course. That can only be an advantage when running a small business. That means that continued business success relies on really knowing yourself, what inspires you and continually developing and striving to be the best version you that you can be – because that is where the key to business longevity and ultimately profit, lie. Learn how to nurture your creative flow. Let me explain how these work for me. I went through business school in the 90s and we were all about vision and mission statements, which are great, but those really aren’t fluid enough for today’s business environment. Starting with Why is both more concrete and more flexible at the same time – let me explain. Everyone knows WHAT they do or sell, they know HOW they do it but very few know WHY they do that thing. Discovering WHY injects passion and meaning into your work. This idea comes from Simon Sinek, who noticed that most people will tell you about their business like this: “Here’s my product, it’s faster, better, prettier than that same one over there, buy my product” – right? Most advertising says what the product does, how it’s different from others like it and then expect a purchasing outcome. What they do and how they do it better, – the usual advertising pitch – while more successful businesses go further and provide customers with their why statement, as well as the what and how. You can watch Simon’s TED Talk here. Knowing your WHY will give you a filter to make choices, see opportunities and be clear about where you are headed – which leads to the next step…. With your WHY discovered you can then determine the THROUGH LINE or the common thread through WHAT you are doing. This idea came from Jocelyne Glei, who I discovered via The Good Life Project podcast with Jonathan Fields, well over three years ago now. You can listen to that inspirational podcast here and while you are there sign up – it really is a great listen. Jocelyn makes the point that we all suffer from the tyranny of choice, choice anxiety and decision fatigue. It’s exhausting filtering the constant stream of opportunities, ideas and information that technology brings from OTHER people. So first accept that you can’t do everything, or even most things. Distil your purpose down to 7 or 8 words that capture what you are trying to do. Know what you and your business are committed to RIGHT NOW. Getting that focus makes decision making almost automatic. It becomes as simple as ‘will this significantly advance that purpose’? It’s a yes or no. The more you are able to say NO, the better competitive advantage you give yourself, as you are able to stay focused on that through line. So, know why you do what you do and define what that means right now, so you can work with focused attention. That leads to HOW you need to work to make the most of that – with vulnerability and imperfection. This idea got inside me and changed my way of being. It came to me via a Ted Talk from Brene Brown, who has spent the last 16 years studying courage, vulnerability and shame. Her TED talk is a game changer and totally entertaining so if you haven’t listened yet I urge you to. The take away for me was this…. People who strive, who are driven, often fall into the trap of seeking perfection. ‘I won’t stop until it’s perfect’ blah, blah blah. Falling for all of that is nothing short of self-destructive, simply because there is no such thing as perfect. Perfection is an unattainable goal. Let me say that again, loudly so those in the back can hear me. PERFECTION IS AN UNATTAINABLE GOAL. Additionally, perfectionism is more about perception – we want to be perceived as perfect. By clients, customers, peers, parents, friends, colleagues, partners, for some that list is endless. Again, this is unattainable – there is no way to control perception, regardless of how much time and energy we spend trying. Haters are gonna hate. Research shows that pursing perfection actually hampers progress and success, and is often the path to depression, anxiety, addiction and life paralysis. If you are a perfectionist, I implore you to give it the hell up. So why do we cling to it when it’s so toxic? Simple. Perfectionism is a convenient cover for fear and shame. If someone criticises our work we can simply say, well I know it’s not perfect, it’s a work in progress, I’m SO not done. So back off. If we accept our imperfections, be they of personality or work product, we have to live with the fear of rejection, the possibility of feeling ashamed of our ‘less than perfect’ work and actually publish the book, post the article, deliver the product or whatever else it is that we are hiding from. Fear is an awesome tool. It kept our ancestors alive long enough to procreate and got us all here. It does tend to overdo it a bit though, and is a bit of a blunt instrument, in that it perceives all fear-filled activities as CODE RED, life threatening situations. That means it sees writing a poem, doing a painting, writing a blog post for example, as the same degree of threat to our life as a stealthy assassin or a drunk punter in a poorly lit car park. We need to get fear to cool it a bit, and that is going to get hard if we are also going to be imperfect and vulnerable. Whenever we tackle fear head on it fights back harder. It’s a fighter by nature. Fear reminds us constantly to be safe, so tell it, ‘thanks for the heads up, I’m good, I’ve taken the precautions and I’m just gonna do this thing anyway’. For skydiving – a reasonable place for fear to speak up – that would be checking your parachute and harness. For creative problem solving, just creating or being curious that fear is over kill and will stop you getting to the best solution or the magic ah-ha moment. Tell fear, as Elizabeth puts it, ‘me and curiosity/creativity are going to do this thing and you can come but there is nothing you need to fight here’. As unlikely as that sounds, that simple conversation gets fear to put the gun down and relax a bit so you can get on with the magic of being vulnerable in your imperfections. We need to become an alchemist of fear and use it as fuel to create courage muscles. Make and curate a list of classes to take, things to try and investigate. Lose your fear of saying ‘I don’t know’ and believe in your capacity to learn. You can’t stay inspired if you aren’t curious. If you can do all of that then you arrive in a place where curiosity and creativity can flourish and you will start to see and feel a cycle of productivity, where some days you are on fire and churning work out and others you are flat and uninspired. That’s when learning to nurture your creative flow comes in. Side note – Creativity has too long been associated only with artistic ventures. It’s more than that and we all have our genius zones where we are comfortable ‘creating’. I can hear some of you moaning through the Ethernet that you don’t have a creative bone in your body and I strongly disagree. We are the creative species, the creative monkey, by nature we are capable of creativity. But, if the term offends you then I invite you to substitute the term curiosity for creativity and see where it takes you. Back to how to nurture your creative flow…. Creative Flow that thing that happens when you are working and look up thinking 20mins has passed and its actually been 2 hours. That means you were totally absorbed and in peak creative flow and working at your productive best. This idea can from Steve Kotler via The Accidental Creative podcast. Steve wrote the book ‘The Rise of Superman’ and researched the psychology and neuroscience of flow. This is when you’re working hard, when you’re overloading the brain with information until it feels like your head is about to explode. Most people never push past this first stage far enough, which is why they constantly miss the doorway to the flow experience. This is when you take your mind off the problem entirely, taking a break, going for a walk or doing something physical. This isn’t the same as watching TV or some other distraction that keeps the brain busy. It’s about relaxing the brain so the conscious mind lets the subconscious mind take over. Many people miss this break and as a result are constantly in overload and burnout, missing flow altogether. This is the superman experience when inspiration takes over and where your preparation and relaxing express themselves almost magically. You come up with the best ideas, you achieve results almost effortlessly, and you often surprise yourself by your own performance. It’s almost an out-of-body experience whether it’s a mastery of a physical, emotional or mental activity. The final stage is where learning and memory are amplified dramatically, consolidating the experience of flow into your unconscious. There’s also a downside, where you come off the high of the feel-good neuro-chemicals released during the flow state. You go on a down which often leads to self-sabotage or an emotional reaction to try and regain the flow state. The key here is not to let this stress block the learning or reverse the results of being in flow, but to move smoothly back to the next phase of struggle and repeat the cycle. Most people aren’t aware of the four stage cycle and so we end up either not getting into flow, or messing things up when they get there. Knowing the cycle exists gives you a map to know where you are, and what to do at each stage. 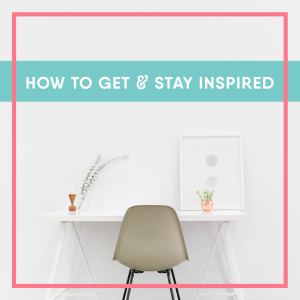 So there it is – a 5 step plan on how to get and stay inspired. What challenge or task do you have where it would really help to step into your flow to conquer it? How much more productive, efficient and enjoyable would it be to be in a flow state more often? How would being able to trigger a flow state improve the profitability of your business? You might have noticed that most of these steps came from a few key sources. If you are a small business owner or an entrepreneur and you aren’t investing in YOU, in your own enrichment, learning and personal development then you are limiting your business success. That doesn’t have to mean enrolling in expensive courses, university or finding a fancy life coach. There is an ocean of brilliant and FREE material available online or in book shops. In my next post I will share with you what I do at each stage of my flow cycle to get the most out of my creative energy. It really just means staying curious and finding some favourite sources of inspiration that feed your flow state. I urge you to get amongst it!